Kim grew up in the Midwest burning wood in her wood fireplace during the cold seasons to keep warm. If you grew up burning wood, you probably had a similar experience to Kim. Smelling the charring wood, the unbelievable warmth you get from a wood fireplace, and the feeling you get from creating your own heat. After Kim moved from the Midwest to San Francisco with her own family, she wanted to bring the same experience she grew up with to her new home. Kim dreamed of having a large, wood burning fireplace that would accentuate her new home. The home is in a prime location, right on the ocean. She wanted her fireplace to create a window from the foyer of the home to the ocean in the back of the house. And, with the damp, cold weather that San Francisco can bring, she wanted her new fireplace to heat her entire home as well. The fireplace was designed around Kim’s vision as a focal point of the house. Using her vision, our Fireplace Advisors were able to determine that our standard wood fireplaces just wouldn’t be large enough to fulfill her dream. A custom wood fireplace was drawn and blueprinted by our Designers to be a large fireplace, that could heat the entire home, and would leave everyone who entered the beautiful home in awe. The fireplace was manufactured with the highest quality materials by our expert welder, Pat. Pat was able to make the drawings and blueprints come to life using his skills and experience. Because Kim confessed to her Fireplace Advisor that she wished to have a faux concrete finish on the outside of the fireplace, we were able to accommodate and make it ready-to-finish. Our finisher, Jamie, finished the outside of the fireplace with panels and slats that would make the concrete finish simple and easy to accomplish. Once the custom fireplace was completed, it was shipped directly to Kim’s nearly-finished home. The fireplace was then craned into the second floor, the desired location for the fireplace. It took five people to move this massive fireplace from the second-floor door to the new focal point. Shortly after, the fireplace flue was installed and the faux concrete finish was applied. Kim’s fireplace has been installed for 11 years, and Pat and Jamie who built and finished the fireplace are still crafting fireplaces at Acucraft today. They remember this project fondly and enjoyed making Kim’s dream come true. This passion for creating dreams that were once just visions are passed onto our clients. Kim’s vision has come to life in a way that recreates her childhood for her own family, in a new place and a new home. Kim’s family will now experience this gorgeous wood fireplace just the way she remembers: the charring wood, the unbelievable warmth, and the same feeling from creating your own heat. From Concept to Completion; Let’s Make Your Wood Fireplace Dream a Reality Together! Request Your Wood Burning Catalog to Learn More Today! Your outside space, if done correctly, can become an extension of your living space. By bringing comfortable seating, coffee tables and even kitchens to the patio, you can increase the visual appeal and monetary value of your home. Not only that, you will be providing your family and friends an oasis and casual place to gather. To create the ultimate outdoor living experience, you will need a quality outdoor fire feature. A fire feature can provide a calming ambiance that naturally brings people together. And there are many things you can do with an outdoor fire feature, especially when the possibilities are endless. When you ask Acucraft to design and create your fire feature, you have the choice of using propane, natural gas, or wood as your fuel. We have standard products: fire tables, fireplaces, and burners, but it doesn’t stop there. We offer custom-made creations; bring your outdoor fire dreams to life. Acucraft’s Fire Tables are offered as free-standing units or built-in enclosures. They are custom designed using the highest-quality components and are crafted by the experts. Fire tables are a work of art that never lose their charm or appeal. Water drainage options are available as well as an array of finishing options. All Acucraft Fire Tables are delivered assembled, ready to be placed into your space and finished with your specific materials (i.e. clad, stone, marble, tile, etc.). Acucraft outdoor fireplaces are designed and crafted with you in mind. Using your vision and specifications, we craft a fireplace that is made especially for you and your space. Whether you have a small space, or if space is no issue, the size of the fireplace unit is determined by you. All Acucraft fireplaces are crafted using the highest quality products, are designed by professionals, and created by our expert craftsmen. Outdoor fireplaces can be crafted completely sealed (gas/propane), with operable doors, or completely open. Acucraft offers uniquely designed burners in all configurations and sizes. All burners include our all-weather ignition system so it can be used no matter what mother nature has in store. An Acucraft outdoor burner can be crafted to fit onto a table top or can span across an entire floor plan. Burners are unique from fire pits because they can be built into your structure while a fire pit is built into an Acucraft structure. Enhance your space, bring people together, enjoy yourself and relax with the tallest flames on the market. 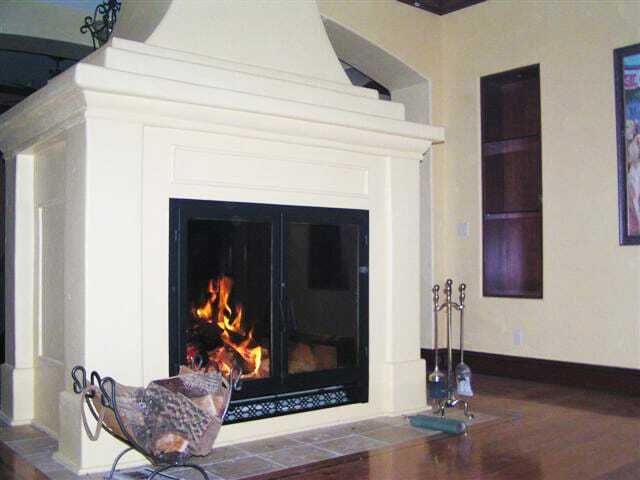 We craft all of our fireplaces, fire tables, and burners with only the highest quality materials. With our expert designers and professional craftsmen, you can be confident that your fire feature will last a lifetime. Leave a lasting impression with an Acucraft Outdoor Fire Feature! Have you been dreaming of a wood fireplace? Are you thinking of getting an outdoor wood fireplace for enjoying a BBQ on the patio with some real fire? Maybe you’re looking for the ambiance of an indoor wood fireplace to relax and read a book by? At Acucraft, you can get the best of both worlds with a patent-pending, indoor outdoor wood fireplace! Indoor outdoor wood fireplaces have many advantages, and seamlessly combine indoor and outdoor spaces. You can heat two spaces at once: your outdoor patio will be warm and inviting for entertaining and your inside space will be relaxing and full of rich ambiance. You will also get the convenience of storing wood outdoors instead of bringing it inside your home like you would with a traditional, indoor wood fireplace. In other words, no mess! With an indoor outdoor wood fireplace you not only get the convenience of wood loading, double the views and ambiance, but you also get ease and enjoyment when you choose Acucraft to create your fireplace. With Acucraft, your fireplace will have two sets of operable doors: one for inside and one for outside. This feature gives you the convenience of loading your wood outside and stoking the fire from inside. An indoor outdoor wood fireplace by Acucraft has a 100% sealed outside door to eliminate risk of cold air transfer. The outside door also has a security locking clasp for additional safety. The options are endless when it comes to an indoor outdoor wood fireplace by Acucraft. With our standard models, you can choose from viewing areas as large as 48” x 42”! Or, if you’re looking for an awe-inspiring grandiose view, we can work with you to create a custom wood fireplace that meets your every need. All of our standard and custom wood fireplaces are built upon order, we don’t have any “off the shelf” fireplaces here! Customize your fireplace to meet your needs with some of our most sought after options: arched or rectangular front and doors, matte black, patina, or custom paint finish options. Add hammering, clavos, or medieval strapping for a more rustic look. And if you’re looking for more efficiency, our water loop and whole home heating options could be the perfect fit for you! 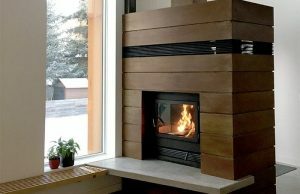 An indoor outdoor wood fireplace by Acucraft offers you everything you desire: over-built fireboxes for lifetime enjoyment, large viewing areas for the best views (whether the fire is burning or not), and earned heat you can only get from a wood fireplace, indoors and out. (Not to mention the many options you have to choose from!) Learn more about your indoor outdoor wood burning fireplaces by speaking with a Fireplace Advisor today! You can also request your indoor outdoor wood brochure right on our website. Request a copy of your brochure today! “I have this fireplace and its the best investment we did in our new construction home...everyone loves it!"